It's been a great week but I have to admit I am tired and ready to go home. Yesterday I started a new project and went into the model room to pick something out I thought I could finish in a day and a half. 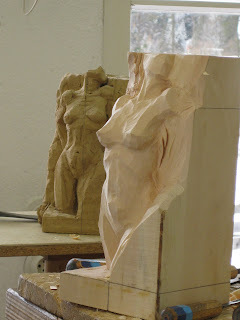 There was a left over model from the June stone class. Pascal thought it would be a good exercise for me and told me to directly model it into a block of Pine with little or no measuring. I drew a center line, took a couple of critical measurements and sketched out the front view directly on the front of the block. At that point I simply just started removing wood from around the perimeter of what would be the figure. I've gotten quite far with it as of noon today and will probably get it finished or closed to finished by days end. 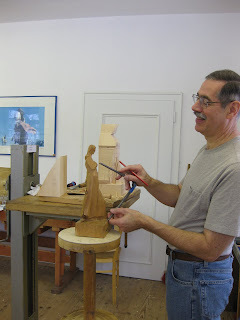 George started his third figure today as well.